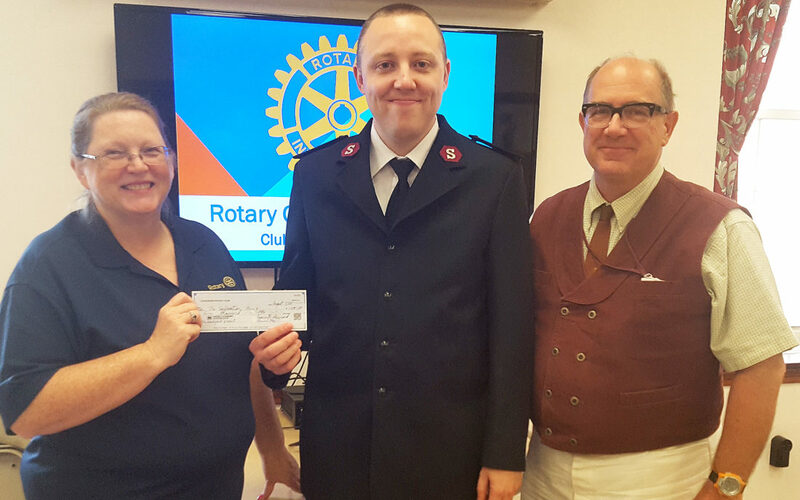 PHOTO PROVIDED The Rotary Club of Lock Haven gave a donation Aug. 7 to the Back to School Backpack program run by the local Salvation Army Citadel. Accepting the gift is new Salvation Army Lieutenant Daniel Johnson, center. Club President April Welshans presents the check while vice president Rev. Taylor Camerer looks on. LOCK HAVEN — The Rotary Club of Lock Haven recently donated to two local backpack programs for kids. The club gave the “happy dollars” it had accumulated for the past 28 months to the Blessings in a Backpack Program. This program is run by the Covenant United Methodist Women who fill backpacks with food and send them to local schools where they are given to students every Friday. The program is designed to ensure the students have something to eat over the weekend. Rotarians give one or more “happy dollars” as a fun fee whenever they want to share happy news. The club gave another donation, on Aug. 7, to the Back to School Backpack program run by the local Salvation Army. 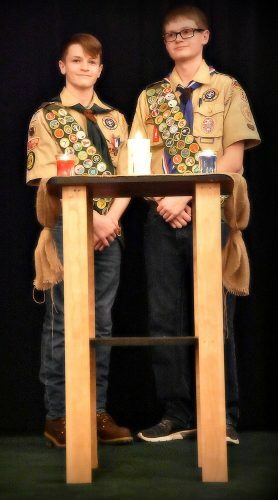 Lieutenant Daniel Johnson, new officer at the local citadel, visited the club on that date and accepted the contribution. Two days ago, club members volunteered at the More than Bread free lunch program at the Salvation Army, a form of community service that they engage in regularly. They will return to More Than Bread on Sept. 17. PHOTO PROVIDED The Rotary Club of Lock Haven recently donated to the Blessings in a Backpack Program sponsored by Covenant United Methodist Women (UMW). 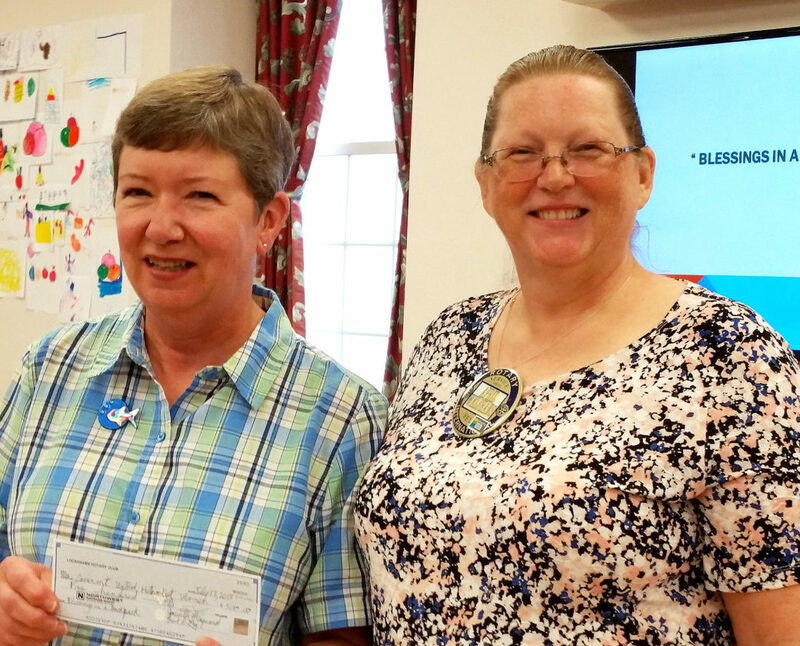 Patty Jones, left, of the UMW accepts a check from Club President April Welshans. The Rotarians eat lunch together every Tuesday at noon, holding informal lunches every other week at a variety of local restaurants and alternating them with business meeting luncheons at Great Island Presbyterian Church. Dr. Craig Willis is club program chair for September and October. For information on Rotary, contact Welshans at 570-279-2964 or april.welshans08@gmail.com.